All the rooms at Quarryfield are en suite or have a private bathroom and the level of comfort is superb. A fine tennis court and spacious games room offers entertainment without leaving the house and yet there is so much to see and do in the area that a week is easilty filled. Golfers will note that Castle Stuart is just 15 minutes drive and Nairn and Dornoch are reached in 30 and 40 minutes respectively. To accommodate travellers flying into Inverness throughout the week, we offer flexibility on arrival and departure days, although during the peak holiday season the minimum let is 7 nights. In addition to the flexibility on arrival day, we also offer part of the house for a smaller number at a reduced rental. By closing off the wing and reducing the number of bedrooms to 5 we can offer the house for parties of up to 10 maximum at a 25% discount. This would comprise 5 bedrooms and 5 bathrooms plus all the public rooms. As the lodge has staff quarters available, why not hire a resident cook to cater for all your shopping and meals? If you really don't want to self cater, there is a local person able to undertake table waiting and clearance as well. The lodge is luxuriously and stylishly appointed and lacks nothing - offering comfort, space, facilities and design second to none. 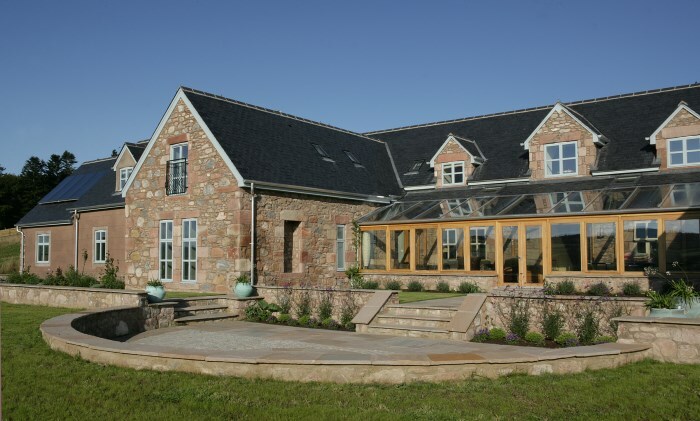 Entry to the front is through the huge glass conservatory, which encompasses a large seating area and table tennis, and affords views across the surrounding farmland and woods. This solar room then opens into the main hall, the drawing room, the snooker room and the west wing. The drawing room is doubled with the dining room and the kitchen leads off here. This ensures relaxed party living where those catering are not excluded from the socialising and general conversation. This huge room can accommodate a dance, and there is a designated area to which the furniture may be moved, making it ideal for Scottish country dancing! The dining table seats 16 and the lodge is well stocked with quality glass and tableware, but for those enjoying Quarryfield in the warmer months, there is a superb half-moon outdoor dining terrace with plenty of seating, which is ideal for barbecues. The kitchen is well equipped for catering for a large party, with ample fridge and freezer space, good cooking and warming facilities, and kitchen equipment designed to make catering easy. The games room, which is accessed from the front or rear hall, is a magnificent room containing not only a snooker table but a 48" plasma screen TV and DVD and soft seating. The bedrooms, six of which are en suite, are all king/twin beds and so can be either one or the other to suit diverse groups. The bathrooms contain baths and power showers and are stylishly tiled on both walls and floors. All bedrooms are of an equivalent standard, although differing in size, and are carpeted and draped in Anta tartan fabric. Throughout the whole house the attention to detail has been strictly observed in the choice of fabrics, carpets and furnishings. In keeping with its Highland location, soft shades of tartan have been chosen from the Anta range of home furnishings, which complement the warm hues of the wood, the creamy stone flooring and red sandstone of the interior. Outside, the grounds have been designed to be used for activities, with the excellent tennis court to the east of the house, the wonderful half-moon dining terrace to the front and south, and the fountain terrace to the west - ideal for catching the last of the sunshine in the early evening. The beauty of the location of this tremendous lodge is that it is just a 20-minute drive from Inverness airport, yet you are surrounded by the peace and tranquillity of rural Black Isle. The access to all points in the Highlands is good, as the house is just a 5-minute drive from the A9.